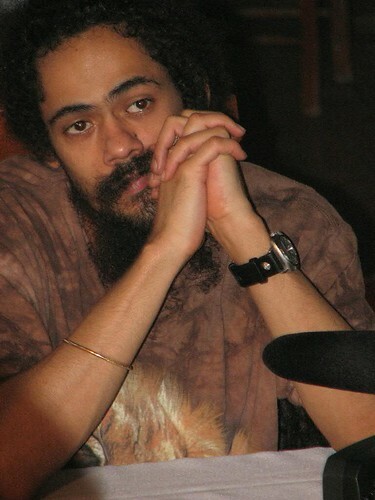 Damian Marley is a Jamaican reggae artist. His father was musician Bob Marley, who was Jamaican. His mother, Cindy Breakspeare (Cynthia Jean Cameron Breakspeare), Miss World 1975, is a jazz musician and model who was born in Canada and raised in Jamaica. He is the half-brother of musician Ziggy Marley and entrepreneur and football player Rohan Marley. His nephew is musician Skip Marley. Damian’s father was of English and Afro-Jamaican descent. Damian’s mother is of Afro-Jamaican descent on one side and English and Irish descent on the other. Damian’s paternal grandfather was Norval Sinclair Marley (the son of Albert Thomas Marley and Ellen Bloomfield). Norval was born in Clarendon, Jamaica, of English descent. Albert was the son of Frederick Marley and Hannah Jane Tiltman. Ellen was the daughter of Richard Bloomfield. Damian’s paternal grandmother was Cedella Malcolm (the daughter of Omeriah/Amariah Malcolm and Alberta/Albertha Willoughby/Whilby). Cedella was a black Jamaican. Omeriah was the son of Robert Malcolm and Katherine Bygrave. Alberta was the daughter of David/Daniel Willoughby and Hannah/Anna Downs. Damian’s maternal grandfather was Louis Cameron Breakspeare (the son of John Cameron Breakspeare and Mavis Louise Haughton Sanguinetti). Louis was a black Jamaican. John was the son of Thomas John Breakspeare and Charlotte Emeline Hall. Mavis was the daughter of Edmund Haughton Sanguinetti and Jessie Louise Verley. The surname “Sanguinetti” in Jamaica comes from Jacob Sanguinetti, an Italian Jew. It is not clear if Damian’s mother is descended from him, or if her family was simply owned by the Sanguinetti family. Damian’s maternal grandmother was Marguerite Cochrane (the daughter of Thomas Cochrane and Lillian Beatrice Vernal). Marguerite was a white Canadian, with English and likely Irish ancestry. Thomas was born in Lancashire, England, to William Cochrane and Margaret. Lillian was born in Canada, to Allen Miner Vernal and Ruth Elizabeth Brown. There are claims on the internet that Bob Marley had some kind of Jewish ancestry (sometimes cited as Syrian Jewish), through his father, or, sometimes, his mother. There is no documented evidence that Bob had Jewish ancestry (the “Bloomfield” family line from which Bob descended, a famous family in Jamaica, is sometimes cited as having been originally Jewish; this is almost certainly false). Whoever posted this is an idiot. His father is biracial so he’s only a quarter black Jamaican. 25% black, 75% white. People seriously need to work on their math skills. His mother is biracial as well. Thus, he is half. I am not sure that biracial is the correct term. Her mother basically looked like a white woman when she was younger, and her father is described as a British-Jamaican of multiracial ancestry on Wikipedia. I guess that she is no more than 1/4-1/8 African, at most. Thank You Ethnic For Putting Him Up. I Respect This Man And His Family! His mother is Jamaican not Canadian. His mother is Canadian you fool.